Dinner for 30 days! Clean wholesome ingredients, nothing artificial and lab tested nutritionals - healthy eating made simple. 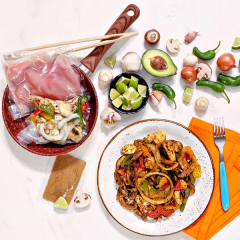 Our Easy Cook™ Stir-Fry selection - always nutritionally balanced and delicious, with no fuss, no meal prep and ready to eat in under 15 minutes! 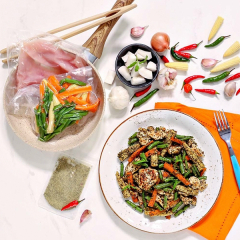 Perfect for anyone looking to eat healthy nutritious meals without the preparation time, simply pour one of our Stir-Fry kits into the pan and enjoy. Mmmm – chilli spiced chicken strips mixed with peppers and red onions fresh and ready cook. No chopping or dicing required – YES! Thai Spiced Chicken with Baby Corn, Green Beans, and Carrots – ready to cook straight from bag to pan. Convenience 1. Waste ZERO! 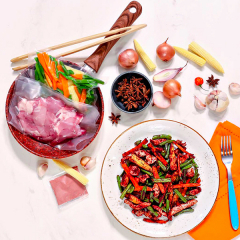 No waste, no prep, no mess, no fuss – just clean, lean and delicious grub ready in minutes all thanks to our GORGEOUS 5 Spice Pork Easy Cook™ Stir-fry! 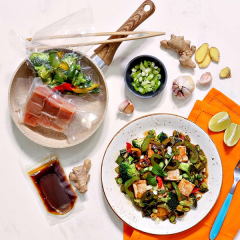 Spicy Teriyaki marinated salmon with mixed peppers, broccoli and spring onion perfectly portioned for one in a handy bag to pan pack! So convenient! Truly delicious meals. Couldnt get used to these. To much messing about. Timed it according to the packet and sometimes, the food was cold, forcing me to cook it again, then the veg was sloopy. 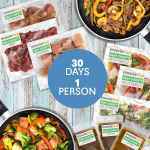 The products it self are great, easy to cook and quick. Especially when having a busy life style. However, the salmon is definetly the least product which I like due to flavour is too heavy - dislike it. Chinese style pork, thai chicken are one of the best once. There could be more flavour in spicy chilli and chicken fajita. Over all as I said, they are great product, easy to cook and saves time on cooking. Next time I will be ordering is definetly without fish option. Totally worth the money- you save a lot , super convenient and really tasty , portion sizes are huge , if you are at uni and need something food that is healthy , tasty , convenient and totally worth the money , then Muscle Food all the way ! Superb service - arrived on time with up to date delivery notifications , Meals literally take 6-8 minutes to prepare and cook , small amount of washing up. Taste is usually a secondary consideration for me so it was a bonus that these taste great (Chinese pork being the best) Portion sizes are good and bigger than what they look in the bags. Definitely recommend if you want to eat decent food with limited time. Great Product. Every care has been taken to ensure product information is accurate, however due to our policy on continuous improvement we do occasionally reformulate our recipes so ingredients and nutrition content may change. You should always read the product label and not rely solely on the information provided on the website. Cooking Instructions: Add 10g of oil to a wok or frying pan and heat to medium high heat. Empty the bag into the wok or pan and stir fry for 8-10 minutes. Check food is piping hot throughout before serving. Manufactured on a site that handles gluten, egg, fish, crustaceans, sesame, peanuts, soya, milk, nuts, mustard and sulphites.